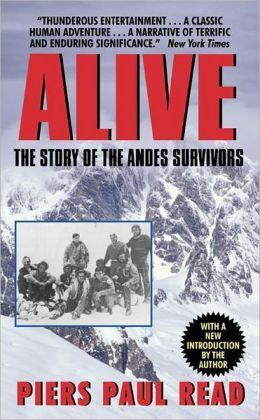 The book Alive by Piers Paul Read tells the story of team of rugby players and other passengers whose plane crashes in the Andes Mountains while on the way to Chile. The pilots intended to fly around the Andes Mountains through a pass to avoid the high peaks, but they made a mistake and turned too early, so when they thought they were through the pass, they were actually in the middle of the Andes Mountains. When the plane descends to land in Chile, the pilots see mountains instead. They try to pull back up but the left wing hits the side of a mountain and crash lands. The fuselage slides down and lands in a high valley. Around thirty people survive the initial crash, but many are injured. Several die from injuries over the next few days. The survivors try to stay warm and ration the food, but keeping warm is a challenge. After about a couple of weeks, the survivors start running out of food, so they opt to eat the dead passengers. Then the avalanche hits, killing about fifteen people. The survivors dig their way out of the snow but in the process find the many dead passengers. They end up eating those people in order to survive. Each person had a job. Some had to get water, some had to clean the fuselage, and some went on expeditions to find more supplies. Eventually, three people decide to climb a peak to see where they are. They eventually hike until they find a place without snow and run into a man on a horse who helps them send messages for help. Eventually, the military rescues the remaining survivors in the end. I felt that this book was very interesting. My favorite part of the book was when Nando and Roberto were saved by a man riding a horse and later on rescued the rest of the crew. The main characters in the book were Nando Parrado and Roberto Canessa. If it was not for these two men, none of the other fourteen survivors would had lived. It was very hard to read sometimes because of the many harsh conditions that the survivors had to live through. They had to make many tough decisions in order to survive in the Andes. I thought this book would only be appropriate for students older than thirteen because the survivors resort to eating human flesh. As long as the reader can stomach the extreme survival tactics, then they will enjoy the suspense and action in this book. Overall, I would rate this book a ten out of ten stars. 1a. The sport that became popular in Uruguay was rugby. Uruguay became so good at rugby that they won two national championships in a row in 1968 and 1969. 2a. The disadvantages were that the Andes Mountains had mountains that were 22,839 feet high. The airplane that they flew in could only go up to 22,500 feet. The weather in the Andes was also really harsh. 3a. There were people from the Old Christians and other young men on the rugby team. Also, there were many middle-ages people with their relatives. 4a. The names of the two pilots were Colonel Julio Cesar Ferrades and Lieutenant Dante Hector Lagurara. 5a. Ferradas had to land the plane because the weather in the Andes Mountains made it impossible to cross. All the passengers groaned because they had to lose a day in their trip. 6a. The two captains thought that they had passed Curuci, but they were actually still in the middle of the Andes Mountains. So, they decided to turn the plane north into the Andes and eventually crashed into an unidentified mountain. 7. How many people survived after the plane crashed? (pg 152? 7a. There were 33 people that survived but several were badly wounded. 8a. They eventually had to eat the flesh of the friend’s dead bodies. Most of the time, they ate it raw, since it was hard to start a fire with so little supply of wood. 9a. Nando Parrado became the “leader” because he was the most determined to get out of the Andes Mountains. 10a. Nando wanted to find help so he, Canessa, and Vizintín began to hike up the mountain. They thought that once they reached to the top of the mountain, they would see green hills of Chile. However, they actually saw miles and miles of other mountains and began to lose hope. 11a. They sent Vizintín back the the fuselage because they were moving too slowly and Vizintín was weak. Nando and Canessa would keep moving forward. 12a. The problem was that they could not refrigerate their food so their food began to rot. 13a. They knew that there would be civilization around because they saw a cow and river flowing. 14a. Nando and Canessa covered about 40 miles through the terrain of the harsh Andes. 15a. Nando and Canessa had spotted a man on a horse across the river. The man got a pencil and paper and tied it to a rock and threw it across the river. Nando began to write that he needed help and that there were still people back in the fuselage. Nando threw the message back to the man on the horse. The man reads the paper and throws bread and cheese to Nando, and the man went back to get help. Once Nando and Canessa were saved, they went on a helicopter to save the rest of the crew.